Does this cover float? i know it lets rain thru, but our last cover sank about 4 inches under the water. A Answered on 3/24/2019 by InyoPools Product Specialist Lennox H.
Hi, Nola. This cover will not float on the water. 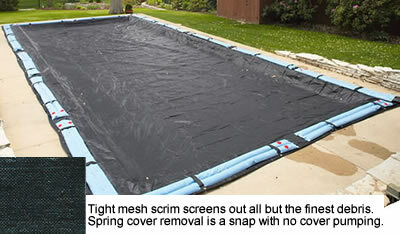 Because of the mesh design, water will flow both ways through the cover. A Answered on 8/31/2017 by InyoPools Product Specialist Stacey M.
Hello, the PL6954 is for a pool size of 20x44, the cover size of this unit is 25x49 to put water bags on to hold your cover in place. I have a lot of large trees in my yard and the cover seems to work very well.